Toshiba has announced the arrival off two new netbooks that add a bit of sparkle to its diminutive computer range. That NB500 and NB520 both have a 10.1-inch LED backlit screen, Atom processors (dual on the 520) and are just 17mm at their thinnest point. The netbooks also weigh a Cheryl Cole-like 1.32KG. Toshiba last range of netbooks, the NB300, offered up impressive battery life and it seems that the NB500 and 520 range is offering the same, with both machines housing a six-cell battery that's good for eight hours' use – 10 if you are using the NB500. The biggest improvement by Tosh, however, is on the audio side. Teaming up with Harmon/Kardon – the speaker manufacturer not to be confused with a Harry Potter character – sound power is attached to these netbooks. Couple this with a Dolby Advanced Audio feature and it seems that Toshiba has nailed it in the audio stakes. Other specs include: 1GB DDR3 memory, a 250GB hard drive, Wi-Fi, integrated webcam, a multi-card reader and sleep and charge USB ports. 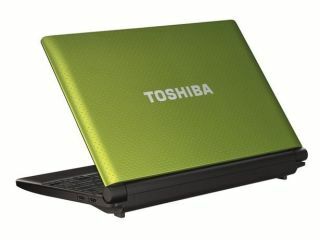 The Toshiba NB500 and NB520 range has a UK release date of January 2011, with prices to be announced.